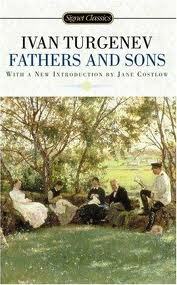 ‘Fathers and Sons’ shouldn’t have taken a week to read. It’s a short book, but it didn’t take long to bore the snot out of me, and once it did, I had to suppress a groan every time I opened it. The only thing the novel has to boast about is a been-there-done-that banality that isn’t even worth getting mad about. It’s instantly forgettable. I have no idea why Turgenev named his book ‘Fathers and Sons,’ as it has nothing to do with that relationship. Yeah, there are fathers in it. There are also sons and peasants and a few chicks, and none of them did anything worth mentioning. One son brings a school pal home to visit. The pal, Bazarov, is an arrogant nihilist who gets into arguments, falls in love, and then dies. Admittedly, it sounds slightly interesting in summary, but I assure you it’s not at all interesting to read. Apparently the book was supposed to be about the peasant class, which is weird, given that I remember exactly one scene containing peasants. I don’t know what Turgenev was going for with this one. Unless it was an unimaginative plot with a dull delivery, he failed.